Click on the link above for an overview video by Lisa Ellis. I didn’t take any photos of the artworks, but they can be seen in the video and of course in the catalog and hopefully on individual artist’s blogs. In conjunction with Art Quilt Elements 2014, Wayne Art Center hosted a SAQA regional symposium and a talk with AQE artists and jurors. The symposium and talk are over, but the AQE exhibit will be up until May 3rd. I skipped the symposium because it cost money and I already felt like I had spent enough entering the show, paying for shipping of my artwork, driving to PA, and two hotel nights. Besides, My mom and I wanted to see a little of Philly while we were there. But, I am really glad we went to the gallery talk. 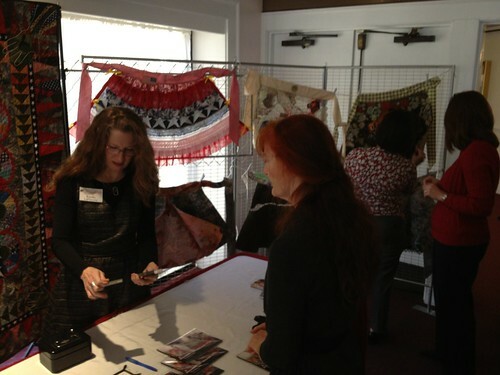 One of the jurors was from the art quilt world, which is good for technical insight, trends, and context. The two other jurors were from the greater textile art world, which brings in a fresh view, broader context, and an eye towards artists concerns rather than technical ones. Unfortunately the art quilt juror wasn’t present, but i thoroughly enjoyed hearing what the other two had to say. These jurors liked large scale. There were no really small artworks in the show, and there were several comments about wanting to see some of the selected art being even bigger. 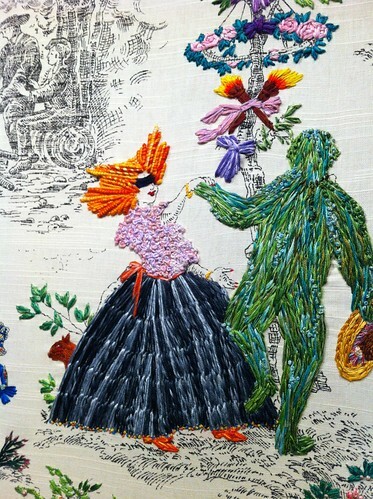 They appreciated good technique but were not nearly as charmed by it as so much of the art quilt world seems to be. The jurors wanted proof of content and intent. I was struck by a difference between what the jurors saw and what the artists spoke about. In the pieces the jurors wanted to speak about, they saw stories and points of view. They were drawn in by intriguing details (Eleven 3 Thirteen by Marianne Burr and Random Thoughts by Elizabeth Brandt), by mysteries that needed unraveling (Greek Revelation by Kristin Hoelscher-Schacker, by plays and modulations of color and pattern (Hostas by Jill Ault, Call for Entry by Sandy Gregg). They wanted to be taken on a journey and to have that journey mean something (Anxiety No. 8, David by Judy Kirpich). They liked when there was a provenance (Home at Valley Forge by Lois Charles). They looked for the concept that drove the work. When the artists spoke about their work, many seemed to focus on their process or technique. It was about arranging fabric until it seemed right, or focusing on details. It was attention to surface design or patterning. Any concept or intent imbued in the work seemed to have been serendipitous. Of course, we didn’t hear from all the artists and there were few that did start with specific intent, and us artists are not always good at explaining our inspirations or motivations on the spot. But I did find the differing points of view to be noteworthy. Another area to think about, brought up by the jurors, was dimension and breaking the plane. Things could wrap, or move in and out, or just suspend away from the wall. Context came into play. Thinking more in terms of installation and including other non-fiber elements to further the story. Asking why cloth? What is the best medium for the message? Of course, these are questions I ask myself all the time so I just ate up all that they were saying. I’ve been frustrated of late with the constrictions of many quilt exhibit venues, so this validated my desire to break away from the 4″ sleeve and move out onto plinths or forms, to work extra large, or to just hang away from the wall. From further away, Complements by Naomi Adams looks textural and complex. Up close, it’s beyond textural — it’s dimensional. And its also simple. I liked it’s contrasts. From Stone drew me in with it’s organic shapes and fissures created with denim and dense stitching that modulates the colors. The big surprise was that it was by Hollis Chatelaine who is known for her portraiture. Diane Firth’s work is pristine as always. Low Tide‘s contrast between sheer tulle and subtly dyed felt is softly serene. Her play of substance and shadow by use of sheers is very elegant. I enjoyed meeting Benedicte Caneille. She is so friendly and charming. Her work is beautiful too. Benedicte’s Units 27: Sunburst and Julia Pfaff’s Contrast XIII hung next to each other and played off each other’s acid greens, deep blacks, clean construction, and contrast of busy and relatively quiet to a marvelous effect. Kudos to Susan Hirsch for hanging those two together. Fun for me to get to meet Benedicte and to see Julia again to represent Virginia art quilts! My favorites were Random Thoughts by Elizabeth Brandt and Otaru Winter by Cynthia Vogt. The shapes in Random Thoughts reminded me of Robert Motherwell, but remain in a quilty context, and the quilting itself is fantastically scribbled and patterned. It has to be seen, not described. Otaru Winter is very simple and the most like a traditional quilt in that it is made up of many small white log cabin blocks. But all those blocks are made of silk and the way they are quilted really accentuates the subtle shimmer of the whole piece. I also liked the way Greek Revelation by Kristin Hoelscher-Shacker plays with foreground and background. First it looks like interesting pebble-like shapes on a green ground, but then you notice that the shapes are really little windows into a scene in the background and all of a sudden you are looking through them trying to puzzle out the story. This is also one of those rare instances where I like the use of the digital imagery. Stroke by Lori Lupe Pelish: commercial fabric as paint! One constructed of plastic bags, two using Tyvek, one predominantly denim. Two artists named Kristin — and we both spell our names the same! The weekend actually started on Wednesday afternoon when my mom and I packed up a large portion of my Army Wife Series, and all it’s accompanying and borrowed display gear, and drove to Yorktown, VA so we wouldn’t have to be up at the crack of dawn on Thursday. Besides, my friend JoAnne, who, in typical Army wife fashion, I had met in Hawai’i and will now keep in touch with whenever our paths cross, is a wonderful hostess. Our occasion was a Joint Services Luncheon at Ft Eustis, VA. The speaker was Tanya Biank, so JoAnne, who was on the organizing committee, suggested my artwork as a compatible display. I enjoyed the opportunity to share my work with an audience who might not normally take the time to see it in a gallery, yet would very much identify with it. I enjoyed talking to many of the ladies and sold a few catalogs and card sets. It was a lot better than letting the artwork sit in my dark closet. On a whim I brought my Square credit card reader which I had never used. It was so convenient to have on hand! The main event though, was for my mom and I to spend two days in the Philadelphia area to attend the Art Quilt Elements opening night reception and related Saturday events. 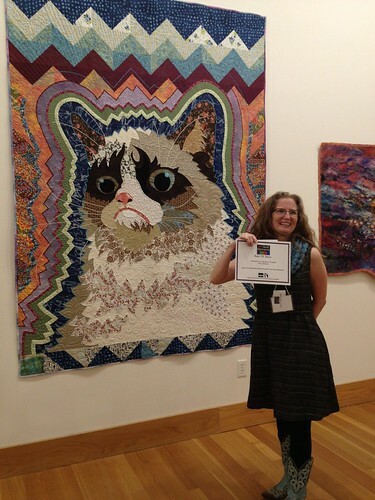 My Grumpy Cat inspired quilt, Zeitgeist, was in the show and I thought it would be a fun outing for us to go see it, to visit another gallery or two, maybe a few Philly sights, and hear the juror/artists talks. I knew my cat was huge, especially since someone noted when it was hanging at my local McGuffey Art Center that it was seven feet tall, but I kind of assumed it would look normal sized in Wayne Art Center’s large gallery and surrounded by other large art quilts. Wow! It stood out as huge from the moment you walk in the entrance. But the REALLY BIG surprise was that Zeitgeist won Best in Show! I was flabbergasted. 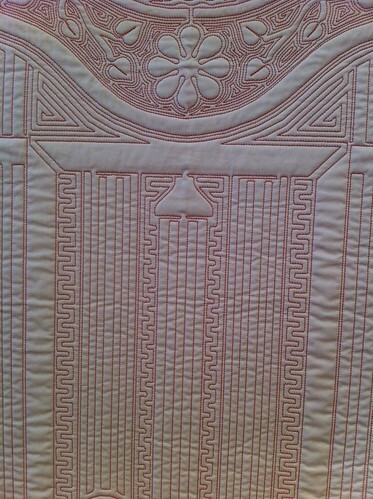 I absolutely love the quilt, but I was even surprised that it was accepted into AQE. 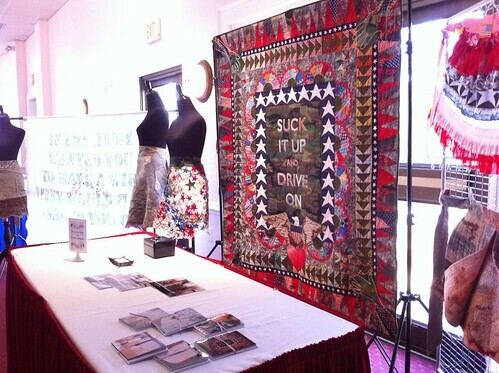 It doesn’t really look like what comes to mind when one thinks Art Quilt show, and it definitely wasn’t what I assumed would be considered prize-winning. I floated for the rest of the evening. I texted and FaceBooked with my friends and family, and let Sara Wood, who long arm quilted the beast know the good news. 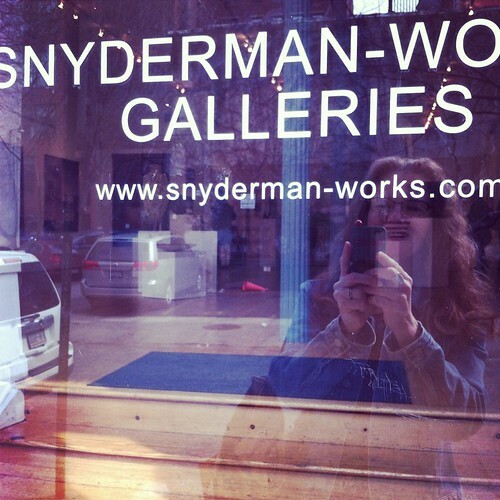 We had Saturday morning free, so I decided we needed to see the fiber art mecca, Snyderman-Works Gallery. 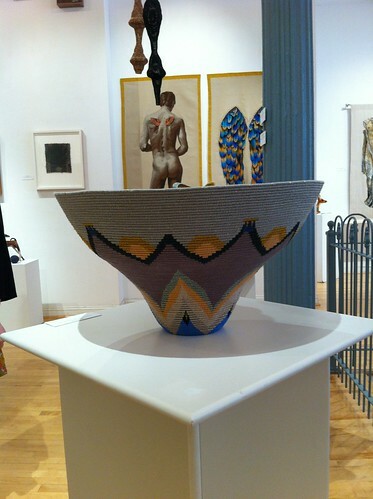 Their Fiber Biennial had just started and so the gallery was filled with a wide variety of top-notch fiber work. I took a few photos, but really, one needs to check out the much better photos at Snyderman-Works’ website or the individual artists’ websites. Aside from the wonderful artwork, I really, really enjoyed that everyone at the gallery was friendly, informative, and readily available. Frank was our docent without hovering too much, and I even had a chance to chat for a bit with the founder, Ruth. Everyone was warm and charming. I wish I had a million dollars so I could support the gallery and the artists they feature. I also liked the work of Norma Minkowitz. One piece upstairs was frieze- or headstone-like with bird-ish forms and downstairs was this piece entitled Compound, which tells the story of the capture (and killing) of Osama Bin-Laden. The work is knit and then stiffened with resin, which intrigued me since I’ve been knitting a lot lately. It was at once cozy and hard. Petal Edge (detail) by Piper Shepard. 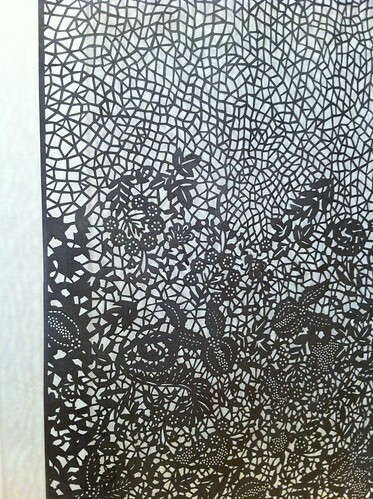 I’m always attracted to cut paper art. There were several vessels by Pamela Becker, like this one entitled At The Sea. They were exquisitely made, and the contrast in sheen between the linen and the rayon threads she uses is subtle and elegant. The patterning and surprise flowers in the bottoms of the bowls was beautiful too. After Snyderman-Works, we walked over to Independence Hall, but didn’t have time for a tour or the Liberty Bell. It was nice to see the historic neighborhood though and Independence park. 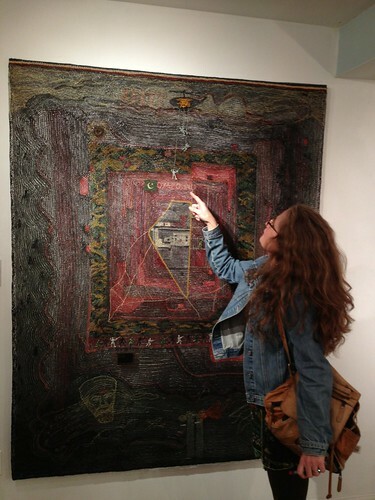 Our next stop was the Art Alliance of Philadelphia to see some funky work by Caroline Lathan-Steifel. After Snyderman-Works, this was kind of a let-down. It was so crafty in comparison. But I did like the way the viewer could interact with the pieces by walking around them or looking through them, often at another piece. 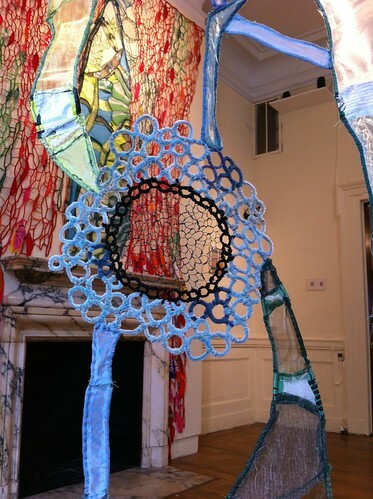 With fabric being a wrapping, enveloping media, I think we should be thinking more in terms of installation work. The rest of the afternoon was back at Wayne Art Center to hear the jurors’ comments about some of the works, and to give the artists present a chance to give a little insight too. I’ll save that for another post though since this is pretty long. Sunday’s drive home was punctuated by a stop at Historic Savage Mill, MD for the annual Homespun Yarn Party where I helped my friend Elisabeth sell her wonderful color changing yarn. Long day, but she appreciated the help, and I had fun being surrounded by yarn goodness. My mom and I came home with beautiful scarf pins and a skein of Elisabeth’s yarn to make next year’s Christmas present for my mom. I feel like it’s been too long between blog posts. I’ve been keeping busy so I actually do have some blog fodder, but it’s kind of a whirlwind so I don’t actually feel like blogging. My mom is here and we to Fredericksburg a few days ago to pick up display stuff from a friend and do a little sightseeing. Then yesterday we went to the Ft Eustis area (Yorktown/Newport News) in preparation for displaying my work at a military luncheon today. After the luncheon, we drove back home and then tomorrow we’re off to the Philly area for the Art Quilt Elements reception on Friday and Meet the Artists event on Saturday. We may stop at a yarn fest in Maryland on the way back Sunday. So, lots to talk about, but no energy to upload what few photos I have, and too many words without photos is boring. So, I’ll catch my breath next week, process it all, hopefully have fun photos from Philly, and report back here with a real blog post soon. OK? OK. I went to Maryland yesterday. In preparation for next week’s showing of The Army Wife at Ft Eustis, I had to go to NIH in Bethesda to pick up the two aprons on display there. Of course, I couldn’t drive three hours for a five minute task, so I planned a few other stops as well. First, I went to Black Rock Center for the Arts. It’s 15 miles further north, but when you’ve already driven over 100, what’s another 15?! 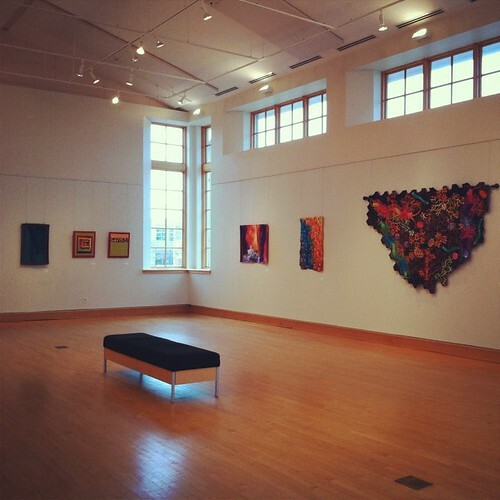 From now until March 28th, the exhibit in the main gallery is A Tribute to Fiber Art, curated by Jodi Walsh. The space is lovely with lots of breathing room and light. I was mostly there to see my friend Lorie’s work, which are the two darker ones in the photo above. You must go to her website for better pictures. I’m just teasing here. I quite enjoyed the variety of work chosen. It ranged from the subdued to bright, textured to polished, abstract to pictorial. And still, it all flowed nicely from one piece to the next. Of course I love Lorie’s 3 Hearts with Wings II, and My Grandmother’s Dresses II, but I also enjoyed Cindy Griselda’s Neighborhood and Around the Block. Her work is bright but not garish, and she’s finished the pristine quilts nicely by mounting them to fabric covered stretchers and/or canvas. Diane Garrison’s Grandmother’s Compost was utterly charming. 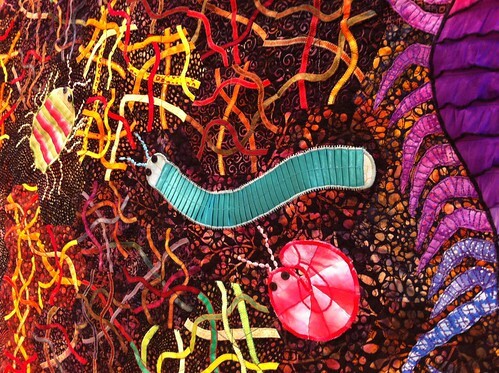 Note the hexagon base on which she’s created pleated and ribboned centipedes and other colorful bugs. Fun, fun, fun. I was mesmerized by Albert Feldman’s One O’Clock. I saw another of his works at Sacred Threads last year, and I still can’t figure out if he’s programmed a quilting machine to create his images, or if he painstakingly counts every stitch as he sews. Whichever, I admire the cleanliness and design of his monochromatic (reminiscent of rework?) pieces. And it’s completely unique in this genre. Contemporary fiber art accessible and integrated into the daily work environment of an urban office-plex. Too often art is held at arm’s length and sequestered in dim, hushed halls to be thoughtfully pondered during a specially scheduled trip to see ART. This exhibit is designed to bring art into the daily lives of hundreds of people, coexisting with them as they move from work task, business meeting or personal break time. Fiber is the perfect medium for brokering this experience of real art for real people. I’ve got THREE pieces in this exhibit! I recognized many other pieces from other art quilters whose work I know and admire, like Lotta Helleberg, and Cindy Griselda to name just two. Plus, it will be on display for three months. My sneak peek says it’s definitely worth making time to come see the work, especially if you’re coming to DC for the SAQA conference. The exhibition will run March – June 2014, so there’s plenty of time to go see it, plenty of time for all the executive types in the building to enjoy all the work (and maybe decide a piece or two needs to stay in their own lobby…). The location is Washington Technology Park, 15000 Conference Center Drive, Chantilly, VA. I’m looking forward to seeing the finished show in May when I return to DC for the annual SAQA conference. Finally, I stopped at the nearby Hancock’s Fabrics to look for thread and batting. I picked up some notions, but they had almost no batting. It’s not a place to go for traditional quilting supplies, but if you’re in the market for dupioni silks, any kind of buttons, or zippers, and dressmaking fabrics in general, this is the place. I strokes the silks and thusly fortified, drove home. It was a good day. This is an Aku Bird. Technically, it’s a Black Noddy, but in Hawai’i it is one of several species of birds known as Aku birds because they follow schools of tuna (Aku) in search of the same food the tuna feed on. Fishermen look for the aku birds when determining where to fish for tuna. In slang though, an Aku Bird is someone who shows up to a party empty handed. He’s happy to eat your chips and drink your beer, but never goes on a beer run himself. It’s not unusual to see a No Aku Birds bumper sticker on a cooler. My aku bird is no freeloader. It is stitched by machine and by hand on a mat woven lauhala style out of plastic bags. 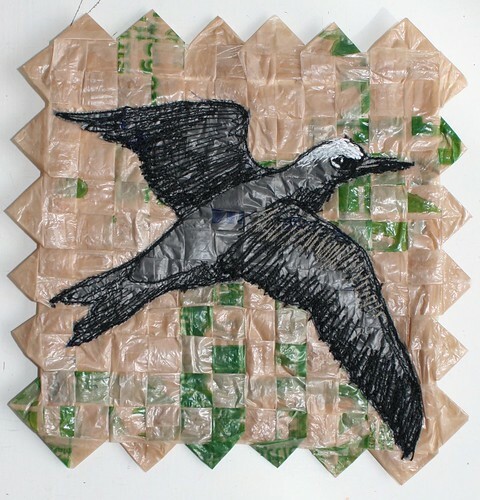 It will be part of a collaborative “quilt” made up of images of many marine animals affected by plastics. The finished work will be displayed next month at McGuffey Art Center in Charlottesville, VA.
For the same show I’ve also knitted a wing-cape for the dance group to use in a performance, and a woven fish trap made from plastic bags. The Army Wife: I’ll be presenting selected pieces at the Annual Joint Forces Luncheon at Ft Eustis on mArch 20th. This is by invitation for members of military spouses clubs, so I’m looking forward to sharing my work with people I know it will resonate with. 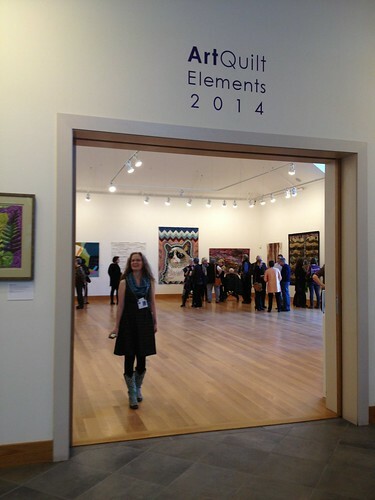 Art Quilt Elements: Zeitgeist is part of this prestigious art quilt exhibit. I’ll be at the opening reception and look forward to meeting in person many other art quilters and enthusiasts who I currently know only by name or artwork. Living With Art: Real Art for Real People: I have three pieces in this regional SAQA show in Chantilly, VA. The exhibit is in the shared space of an office park and should highlight how well art quilts fit into a corporate environment. Since the art will hang from March through June, it would be a good excursion for anyone attending the SAQA conference in early May. 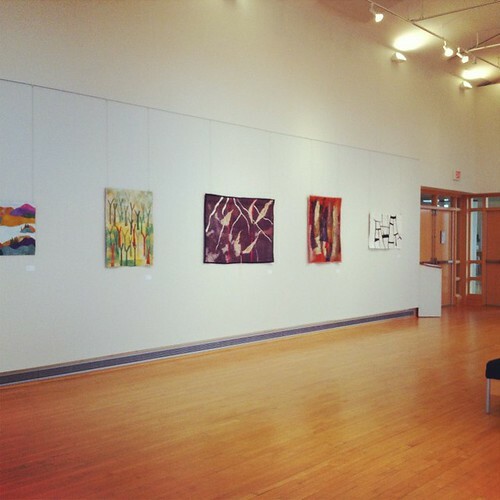 Art and Ecology exhibit: at McGuffey Art Center. I’m pleased to be participating in this group show in April, which promises to be eclectic and educational! I’m on the local artists panel at the SAQA conference in April. I hope to see lots and lots of people there! Join me tonight, Friday, March 7th at Derriere de Soie on the Charlottesville Downtown Mall for a First Friday reception. 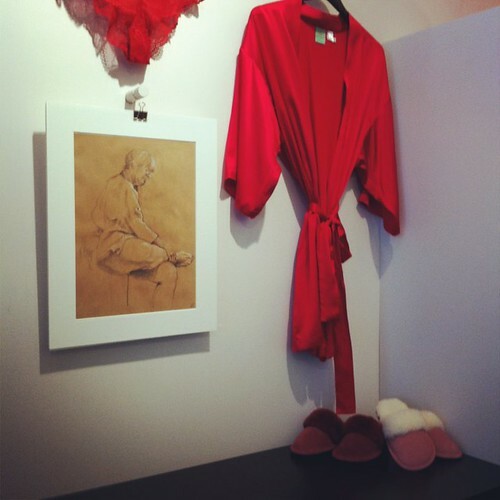 My figure drawings mingle with all the lovely silky things in this tasty lingerie boutique. What’s not to like about a store that supports it’s local art community? The drawings will be on display the entire month of March. Enjoy the drawings and pick up something silky too!